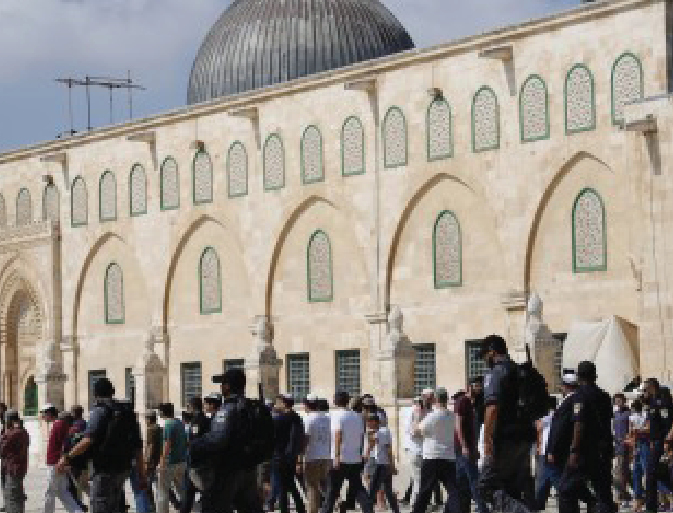 JERUSALEM (AA): Grand Mufti of Jerusalem on Sunday warned of “religious war” after hundreds of Jewish settlers stormed East Jerusalem’s flashpoint Al-Aqsa Mosque. According to the official Wafa news agency, Sheikh Mohamed Hussein said in a statement that the storming by the Israeli settlers would not change Arab-Islam pattern of Jerusalem. “But perseveration of such attempts will drag the region into a religious war,” he said. Earlier, more than 1,000 Israeli settlers forced their way into the Al-Aqsa Mosque compound under heavy protection of Israeli police. Firas al-Dibis, an official with Jerusalem’s Jordan-run Religious Endowments Authority, said Israeli police stormed the compound before the settlers and carried out protective sweeps and search. The move came days after Knesset (Israel’s parliament) passed a controversial law that recognizes Israel as the “nation-state of the Jewish people”. Israel occupied East Jerusalem during the 1967 Arab-Israeli War. It annexed the entire city in 1980, claiming it as the capital of the Jewish state — a move never recognized by the international community.